This year’s inductees were Bomanite founders Dan Sieben and the late John “Jack” Dryden; Joe Garceau, of Butterfield Colors; and the late George Lacker, of GLC3 Concrete and Couture Concrete Systems. Dan Seiben, 74, cofounded the Bomanite Corp. in 1970. He served as president and CEO of the company for 19 years before leaving to pursue business startups in various fields. Bomanite grew into a leader in decorative, imprinted concrete, with franchisees around the world. Seiben is a Northwestern University graduate who earned his M.B.A. at Columbia University. He lives with his wife, Kay, in Mexico, and is a father of two and grandfather of five. 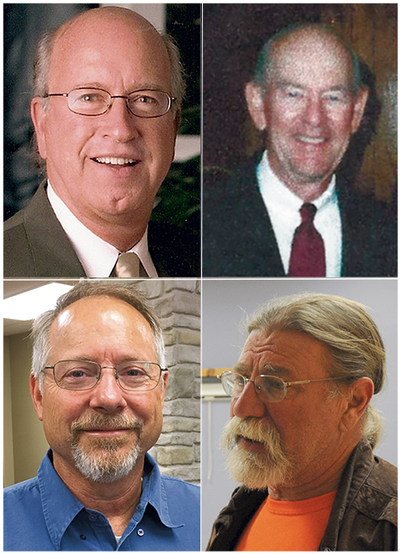 This year's Decorative Concrete Hall of Fame inducteers are, clockwise from top left: Dan Seiben, the late Jack Dryden, the late George Lacker and Joe Garceau. Jack Dryden, a WWII vet, was a contractor in Southern California in the 1950s and '60s, and got involved with Bomanite in its early days after meeting cofounder Brad Bowman. Dryden developed a stamped-concrete/wax installation system that gave stamped concrete a price advantage over other similar systems. He retired from Bomanite in the early 1980s and passed away in 1999 at age 78. George Lacker, who passed away last March at the age of 62, was the owner of GLC3 Concrete and Couture Concrete Systems, of Fort Lauderdale, FL. Lacker began his career working for Baker Concrete in Ohio at age 16. In 1996, he introduced Concretetivity, a cementitious topping that can be applied between 3/8 and 2 inches thick. He received numerous industry awards during his lifetime. He is survived by his life and business partner of 28 years, Cathye Rankin. Joe Garceau started a concrete contracting business in 1977 at age 18, and began doing decorative concrete work two years later. He honed his craft along with his brother, Jerry, and in 1994 they founded Butterfield Color Inc., a decorative concrete manufacturer headquartered in Aurora, IL, which does business nationwide, selling concrete coloring, stains, release agents, tools and many other products. The Decorative Concrete Hall of Fame, which numbers 28 individuals and two companies, was started in 2010 by Eugene, OR-based Professional Trade Publications, publisher of Concrete Decor magazine. The Hall honors "individuals and companies who have gone beyond the call of duty to help promote decorative concrete as a thriving business and a constantly evolving art form." Editor's note: An earlier version of this story mistakenly referred in the photo cutline to Joe Garceau as deceased; D+D News regrets the error.